Time for another release on Earth Mantra, and time again to welcome a brand new artist to our roster, this time ambient alchemist Meho. Hailing from Bosnia/Herzegovina and Sweden, Meho concocts mysterious brews of foreboding ambient soundscapes that we find eerily beautiful and deeply moving. In his debut Earth Mantra release, called Pust Grad (which means "Deserted City" in English), Meho takes us on a journey through a post-apocalyptic world, one inspired by his journeys through the deserted villages of Bosnia, places empty since the end of the war there in 1995. Meho describes the impression on him of these journeys as: "... a really creepy feeling to see those villages and to walk around there. It kind of reminds me of pictures from the ghost town Pripyat but on a smaller scale". Thematically, the music is certainly about urban landscapes devoid of human habitation, places where nature has taken back over, a dualism between the return of the beauty of nature and the unsettling feeling of knowing that people are really supposed to be around, but are not. We think that Meho has captured the essence of these feelings perfectly in this album, which has plenty of visuals and oodles of lush darkness to spare. Musically, Pust Grad will certainly appeal to lovers of dark and textural abstract ambience. This is some of the finest and most complete dark ambience we've heard in awhile, very cinematic, the kind that sends chills down your spine and might even make you look over your shoulder. In fact, we challenge listeners to put on the headphones in a darkened room, perhaps while a thunderstorm rages outside, and listen to this album end to end. We found the music to simultaneously isolate us from the outside world, while encapsulating us in a strangely beautiful realm of pure foreboding magic. A bit scary, but truly rewarding. 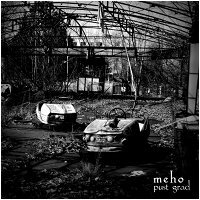 So it is with great pleasure that we introduce Meho to our audience, and unveil his latest creation Pust Grad. We hope this is the first of many such releases in the future. Highly, highly recommended. Excellent work on textures and dark atmospheres. April 28, 2012 - geoff n.
very much digging this! Thanks Meho & E.M.! Yup. This is dark stuff. Very eerie and haunting.The music inhabits the mind. It also reminds me that war was the cause for these deserted villages. Your write-up is spot on. Never listen to this music during daylight hours - unless you're in a really deserted place. Thanks again.